I had eaten Undhiyoo once, when I was very young. Oh I must tell you, it was so delicious. I was told this is a Gujarati recipe prepared as a feast. But later I never really got a chance to taste real authentic undhiyu (though the parties I attended served one, never tasted that good). 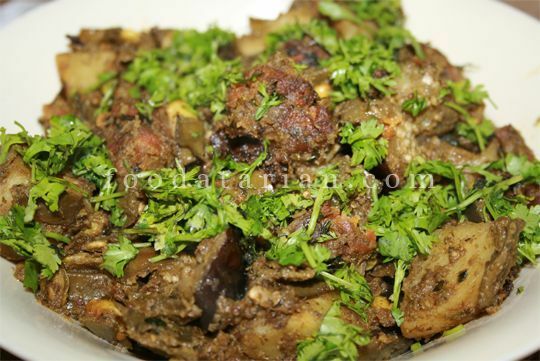 I found this recipe somewhere, though it was titled as Undhiyu, I am not quite sure if this is an authentic Undhiyu recipe. But I must say, this preparation is equally good. Try it out! 1/4 tsp haldi (turmeric powder). Lots of fresh coriander leaves; chopped. Grind all the ingredients of the masala paste with little water (as required). 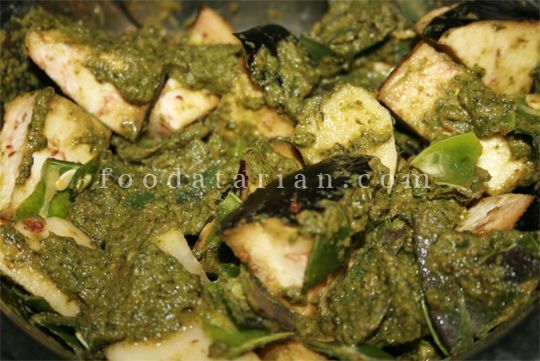 Stuff the brinjals with the some masala. In a bowl, put beans, yam and papdi and pour some masala over them. In another bowl, put potatoes, sweet potatoes, banana and add the masala, mix to coat well. Cover all the vegetables and set them aside for around 30 minutes. Meanwhile prepare mixture for muthiya by mixing all the ingredients except oil. Heat oil in a kadhai. Make small muthiyas and deep fry them in oil on low-medium flame until golden brown in color. You can use the same oil for making the vegetable. Later in a large kadhai, heat oil or ghee, add ajwain, heeng, turmeric and add first set of vegetables – beans, yam and papdi along with the masala. Stir and cover and cook until all these vegetables are done. 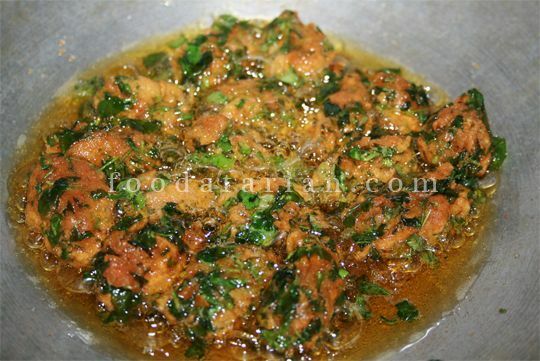 Then add some chopped coriander leaves and remaining vegetables. Mix well and cover and cook. Uncover and stir ocassionally. This vegetable is completely cooked in oil/ghee, no water is added. Hence keep stirring ocassionally, else the vegetable would stick to the bottom of the kadhai. When all the vegetables are almost done, add the muthiyas and salt and garnish with lots of fresh coriander leaves before serving. You can use other vegetables like snake gourd, bottle gourd (dudhi), ivy gourd or any other vegetables in the same green masala. They will taste much better. recipe to make vegetable is very good its excelent. Good and authentic recipe..very similar to the one made at home.